We love publishing your reviews. They’re honest (mostly! ), objective (hopefully! ), unrelated to advertising (bien sûr!) and cover a wide range of tastes, prices and places. You might not always agree, the chef might be having a bad day, your standards might be higher… or lower… but they give you an idea of what’s available across the region. Summer may be over but it’s still warm enough to eat lunch outside (if you can dodge the rain drops!) or ‘en terrasse’ beneath the stars but you might need a ‘petite laine’. 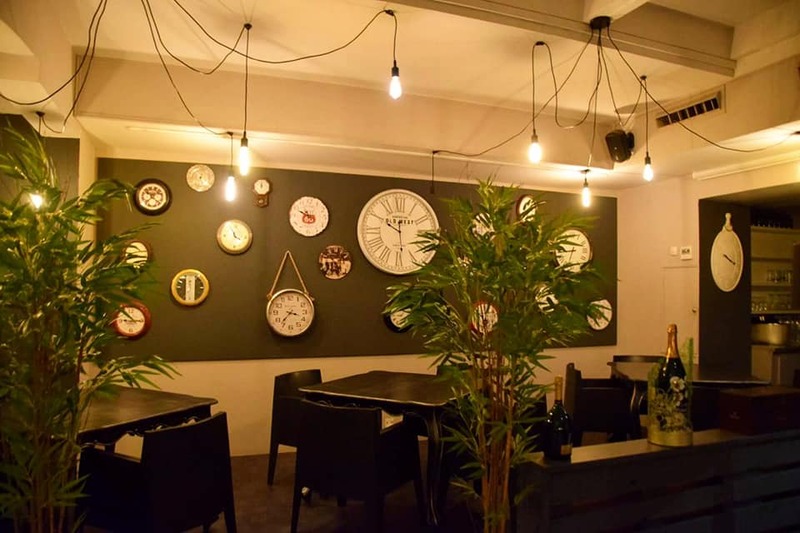 Although actually located on Rue Font Froide, l’Horloge has a beautifully situated terrace on Place Gambetta giving a breathtaking view of the Cathedral de St-Jean. On a sunny afternoon, find a shady spot under one of the olive trees or if the weather is not so good, take a seat inside and check out the collection of clocks on the wall. Plenty of tables are laid out for either simply having a drink, or for eating. Wine and Sangria is available either by the glass, bottle, or pichet. Food is mainly French/Catalan as well as a nice mix of tapas. A plat du jour is available for 10 €, although my particular favourite is the burger (15 €), one of the best that I have tasted! During December, a chalet is erected serving mulled wine as well as tasty winter snacks. Nico is the helpful and attentive owner who will greet you with a smile. Closed Sunday & Monday. 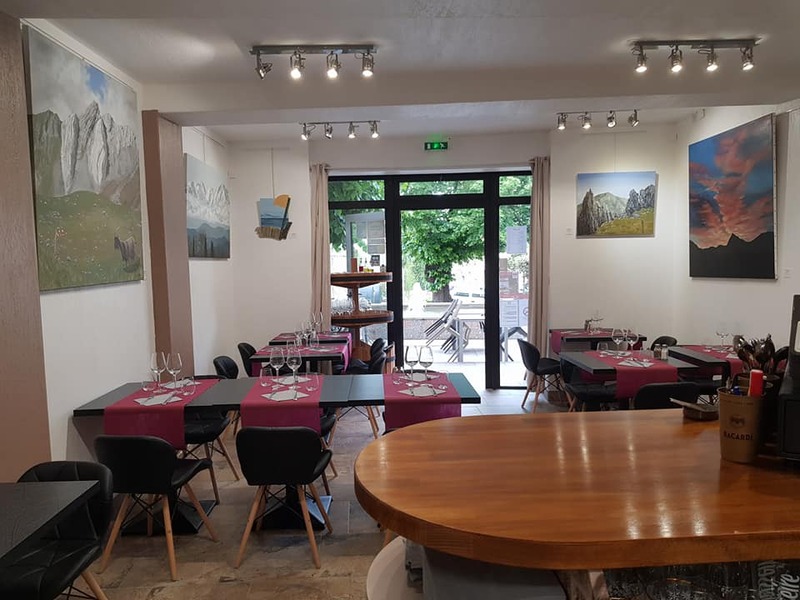 Thanks to whoever it was that recommended ‘La Galerie’ restaurant in Céret. We had a fabulous lunch there today. We all had the ‘formule’ which was 15 € for 2 courses and 19 € including dessert. Gorgeous tomato/mozza salad or gazpacho for starters (both very good) followed by beautifully cooked dorade with veg. Peaches in wine sauce with raspberry sorbet for pud. Only slight ‘bemol’ is wine not served by the pichet, but a yummy glass of Dom Brial white was great. Delightful service – quite slow as they were very busy on market day in August. 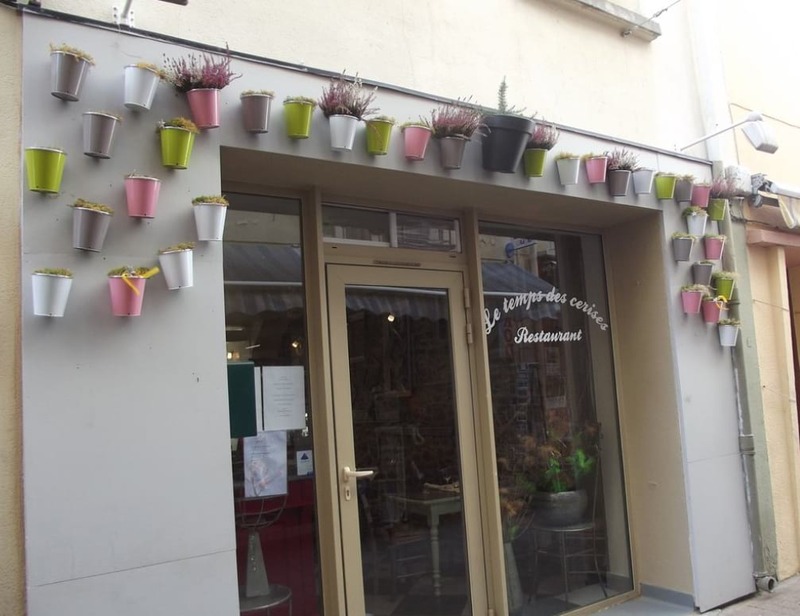 Great to find a new resto in Céret which is well priced, fabulous food and great service. Five stars from all of us! The restaurant is at the bottom end of Rue Saint Ferreol by the fountain (which apparently commemorates the engineers who built the arrosage system!). 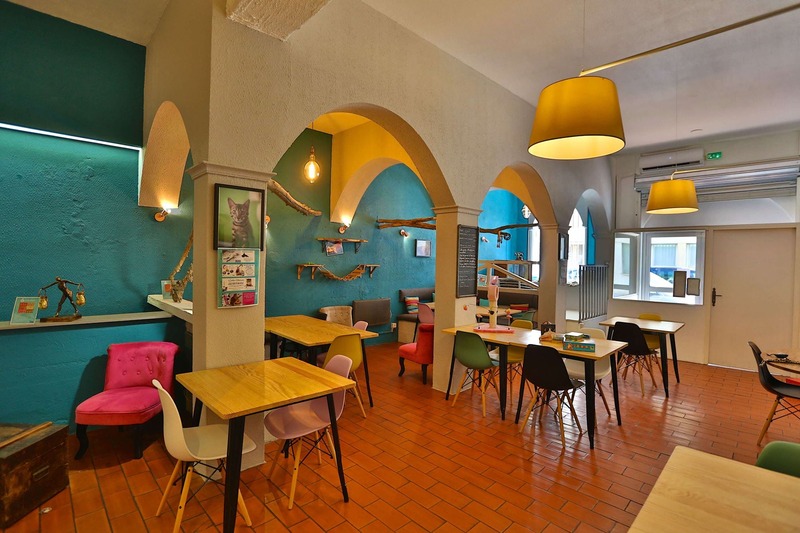 Ate lunch with grand children in the Cat Café in Perpignan. Great fun and good food too. The best macarons ever. Friendly couple running the place. He speaks English. The cats are used to people but there’s a shy one. It’s also a salon de thé and there’s a little boutique corner with ‘catty’ items. The cats are free to do as they please and of course no harassment is allowed. 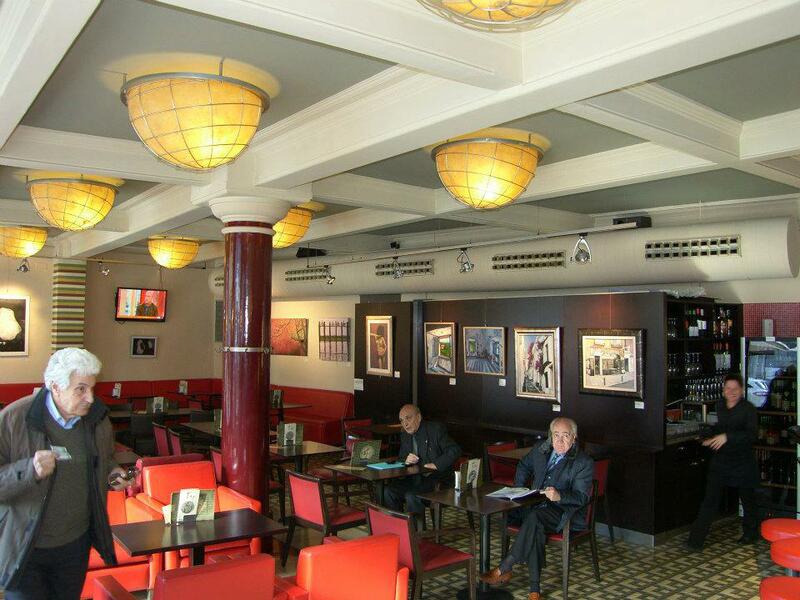 We love this restaurant and have been several times at midi. For any of you who watched Les Innocents on TV, the whole crew stayed there and a lot was shot in and around La Llagonne, a pretty village on the way to the ski resort of Formiguères, so easily accessible from Les Angles and/or Font Romeu. 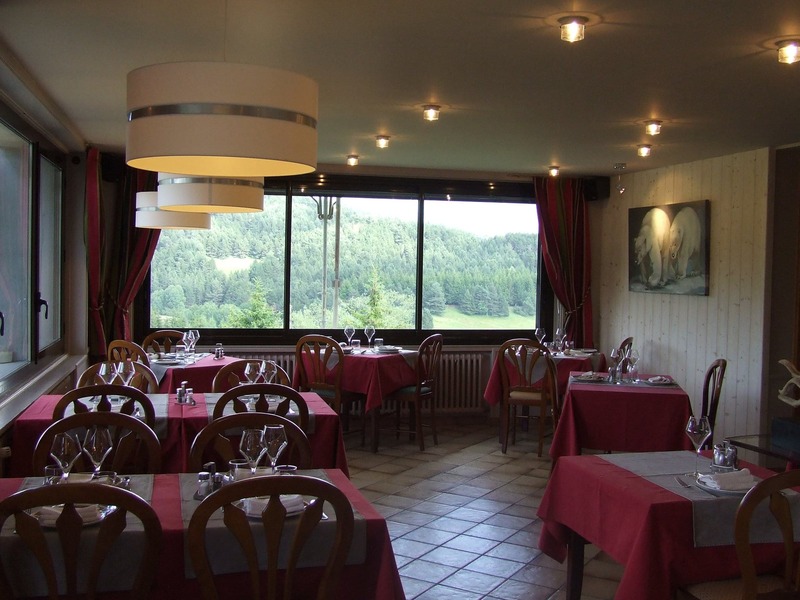 The restaurant has fabulous views across the mountains and valley, is cosy but smart and the service is excellent. Produce is sourced locally and it is run by Francis and his wife who are passionate about their food. Lunch menu is 18,00 € and dinner from 28,00 € as well as as an à la carte menu. The food is imaginative and fait maison and they serve a good selection of wines. We particularly like the Mas Camps. Choose from chicken, lamb or prawn… and vegetarians are equally spoilt for choice. Most dishes err on the mild side (perfect for spice wimps like me) but if you like more of a kick, just ask and they will spice to to your taste. Start with the house cocktail, a refreshing blend of sparkling white wine and elderflower juice and a pile of hot crispy poppadoms with pickles and mint raita or share a Thali for 2 – an Indian take on a Tapas sharing plate giving you a taster of their specialities. Portions are generous, but don’t worry about ordering too much as any left overs are boxed and bagged for you to enjoy again at home! If spicy doesn’t flick your taste buds, book for Saturday lunch: fish ‘n’ chips (with an optional glass of London Pride). Flaky fish in a perfectly crispy batter with home made chips and pea purée. 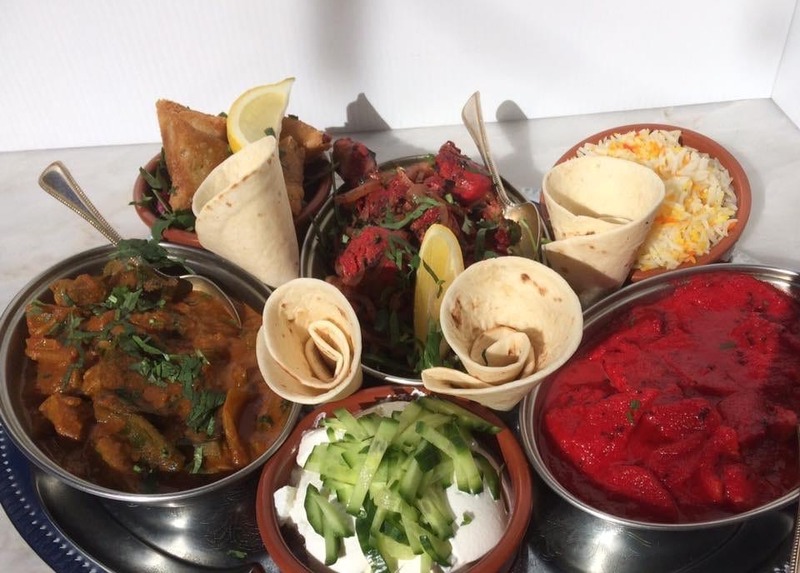 Indian restaurant & Takeaway and fish ‘n’ chips in one town – what more could you ask for? 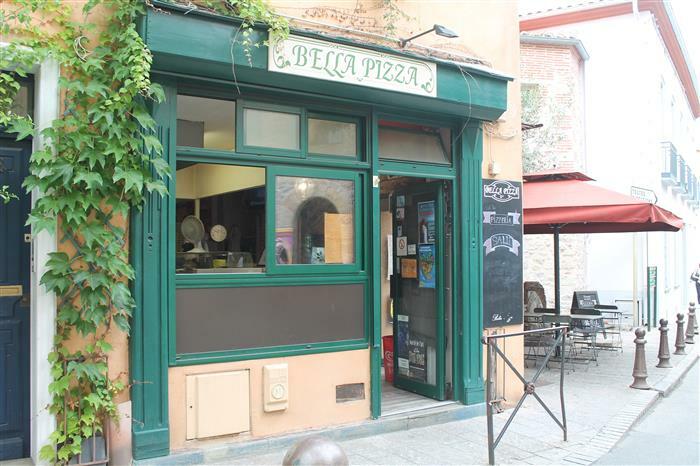 Bella Pizza is your typical French street-corner eatery, a small terrace opposite the music museum and space indoors if the weather is unpleasant, but alongside the Vesuvios, Romanas and Margaritas, there are now fabulous salads, steaks, desserts and even sweet pizzas for the seriously sweet-toothed. Noticeably absent from the menu is a starters section, but who needs an entrée when the portions are so generous? We had steaks seasoned to perfection, and a healthy portion of crispy, fluffy fries and dressed greens – delicious. And all for 14 €. Chocolate fondant was gooey and gorgeous and the patisserie of the day was a fruit roulade which was fresh, light and crisp. The Catalan favourite Cap D’Ona beer is on tap here for 3 € (25cl) and a half pichet of juicy rouge cost 6 €. Highly recommended. Bon appetit! 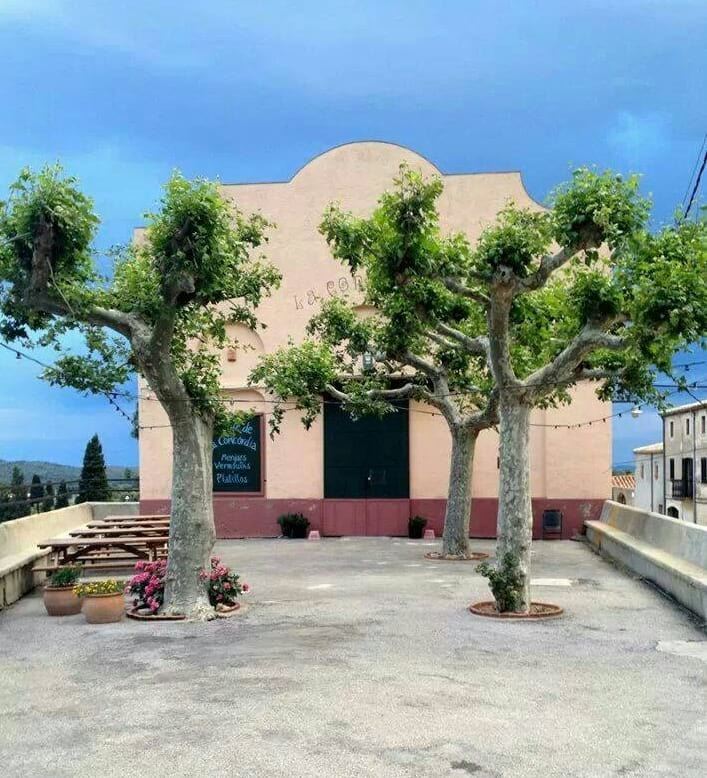 A long time ago I had a delicious and interesting meal at Montferrer and heard the owners had moved to pretty Prats de Mollo. Sitting at one of a couple of tables outside, we were warmly welcomed, and offered amuse-bouche of sweet melon with salty ham, and crunchy and acidic dried fruits and nuts. We enjoyed an apéritif looking at the amazing trompe-l’oeil – hard to work out what’s real! We all chose the 25 € menu (there is a 18 € formule du midi too). Pêches farcies a l’ancienne and saumon façon gravelax proved to be both a fantastic blending of textures and flavours with herbs, fruits and flowers from the garden. Really delicious, followed by equally amazing dishes and desserts. With two demi pitchers of a fresh and fruity pink wine, water and freshly made mint tea, a really lovely and interesting meal, well worth the twisty drive. After lunch, take time to enjoy and explore the village too. This gem is situated in the backstreets of Perelada with a very nondescript exterior but once inside you will be pleasantly surprised by the menu, the views – and the outstanding dessert trolley. Excellent choice of meals and friendly service. 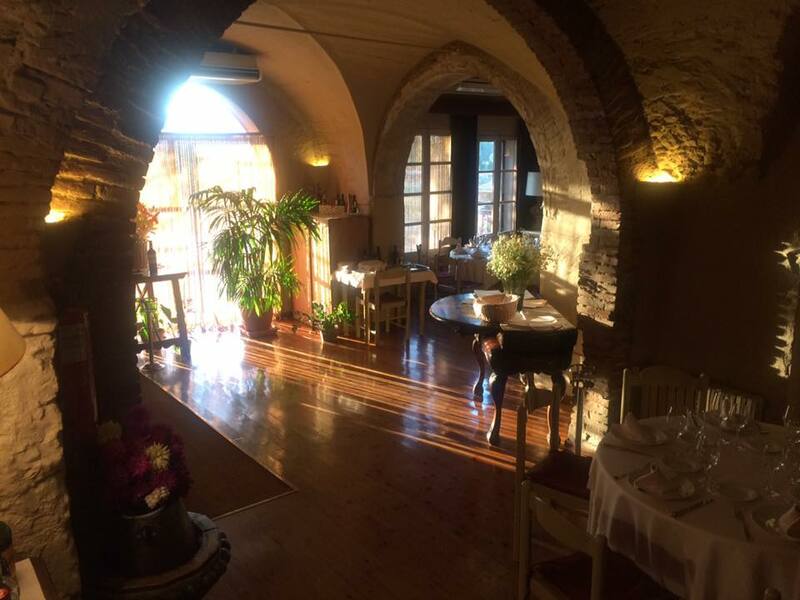 I strongly recommend the restaurant of the Hotel Paris in Figueras on the ramblas … Eating outside on the terrace with your doggy isn’t a problem, and it’s very pleasant. Food is tasty and their menu prices are more than reasonable! Also the manager/owner is ever so nice! Rediscovered an old haunt. Changed hands since we last passed this way. Really good, simple, Catalan fare at the Casino (or village bar) in Cantallops. Not a frozen chip in sight. Midday menu 10.50€. Excellent Cantallops wine by the carafe. DO YOU KNOW A RESTAURANT YOU WOULD LIKE TO RECOMMEND? WE’D LOVE TO HEAR FROM YOU. CONNAISSEZ-VOUS UN RESTAURANT QUE VOUS VOUDRIEZ RECOMMENDER? ON SERA RAVI DE VOUS ENTENDRE. SEND YOUR COMMENTS TO US AT INFO@ANGLOPHONE-DIRECT.COM.